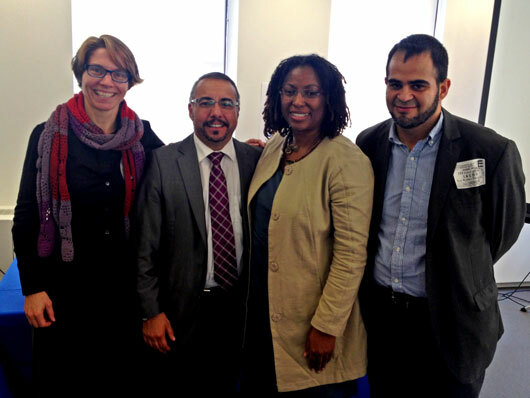 Marianne Møllmann, Andrés Rivera Duarte, and Wilson Castañeda with Tracy Robinson, Chair of the Inter-American Commission on Human Rights (IACHR). Today in Washington, the International Gay and Lesbian Human Rights Commission and two of our partners spoke out against the widespread and systematic violations of human rights against the transgender population of Latin America, especially discrimination and violence, at a hearing held by the Inter-American Commission on Human Rights. Marianne Møllmann, IGLHRC’s director of programs, Andrés Rivera Duarte, a consultant to IGLHRC on transgender rights in Latin America and to the Chilean National Observatory for Human Rights and Law, and Wilson Castañeda of the Colombian group Caribe Afirmativo testified. Discrimination and violence against transgender individuals occurs around the world at an alarming rate. The situation is especially gruesome in Latin America. According to the latest statistics from the Trans Murder Monitoring project of Transgender Europe, also released Thursday, 1,612 murders of trans individuals were recorded in 62 countries from 2008 to Sept. 30, 2013. The majority of these killings—1,250—were reported in Central and South America. The figures were released ahead of Transgender Day of Remembrance which occurs annually on November 20. Andrés Rivera Duarte testifies about violence against trans people in Latin America. The disproportionate violence in the region was the focus of a 2012 report by the International HIV/AIDS Alliance, The Night Is Another Country: Impunity and violence against transgender women human rights defenders in Latin America. Møllmann, in her testimony, underscored the fact that laws in the region compound many of the problems facing trans people by conflating sexual orientation and gender identity. These problems range from access to education and health care to justice. According to Møllmann, this conflation finds its most extreme expression in the murders of trans women by their boyfriends, or other male acquaintances who would rather kill than be considered “gay” because they are attracted to a trans woman. Murders in Argentina, Perú and other countries across the region tragically demonstrate this pattern. While Møllmann notes that international human rights law treats both sexual orientation and gender identity as prohibited grounds for discrimination, the categories often are excluded from explicit protections in domestic law. “Both are linked to discriminatory stereotypes about how men and women ‘should’ be and act,” she said. By working to overcome these stereotypes, states can discharge their obligation to achieve true gender equality, she said. Note: This post will be updated with full transcripts of Marianne, Andrés and Wilson's testimony as soon as they are available. Read Andrés Ignacio Rivera Duarte's testimony before the Inter-American Commission on Human Rights (in Spanish).